Westfield Football Club celebrated its first away league victory of the season yesterday (Saturday). The Westies triumphed 2-1 against Seaford Town in Macron Store Sussex County Football League Division Two, matching their win at home to Little Common seven days previously. 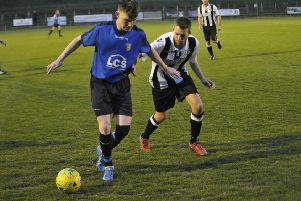 Goals from Jethro Warren and Curtis Coombes did the damage for Westfield against bottom-of-the-table and still pointless Seaford despite having Dom Burt sent-off. Westfield remain 11th in the 15-team division, although they are now only four points outside the top seven and have an eight-point cushion above the bottom three. Elsewhere in the same division, Bexhill United’s scheduled trip to Oakwood and Little Common’s home game against leaders Worthing United were postponed due to waterlogged pitches. Standings (played-points): 1 Worthing United 16-42, 2 AFC Uckfield Town 18-35, 3 BEXHILL UNITED 17-33, 4 Wick & Barnham United 14-30, 5 Mile Oak 15-27, 6 Oakwood 15-27, 7 Steyning Town 15-24, 8 LITTLE COMMON 17-23, 9 Haywards Heath Town 17-22, 10 Rustington 17-20, 11 WESTFIELD 16-20, 12 Midhurst & Easebourne 16-19, 13 Storrington 17-12, 14 Saltdean United 15-11, 15 Seaford Town 17-0.